A huge fire has ravaged a Serbian Orthodox Church in downtown Manhattan, on the day that Orthodox Christians are celebrating the Holy Easter. It took some 170 firemen several hours to bring the four-alarm blaze under control. While initial reports suggested that there might have been people trapped inside the burning building, fire department confirmed there were no injuries or casualties. The city’s fire commissioner, Daniel Nigro, told the New York Post that the cause of fire remains under investigation. One man is being checked out for “smoke inhalation,” Nigro added. “It’s a very sad day today,” Nigro said, adding that the night before some 700 people had gathered in the Church for an evening service to celebrate Orthodox Easter. “We're all alive, but the building is gone,” the parish priest, Fr. Djokan Majstorovic, told RT. It took firefighters hours to contain the blaze that started at around 7:00pm local time. Additionally, the NYPD has reportedly requested a Level 1 Mobilization at the scene of the fire for crowd control. 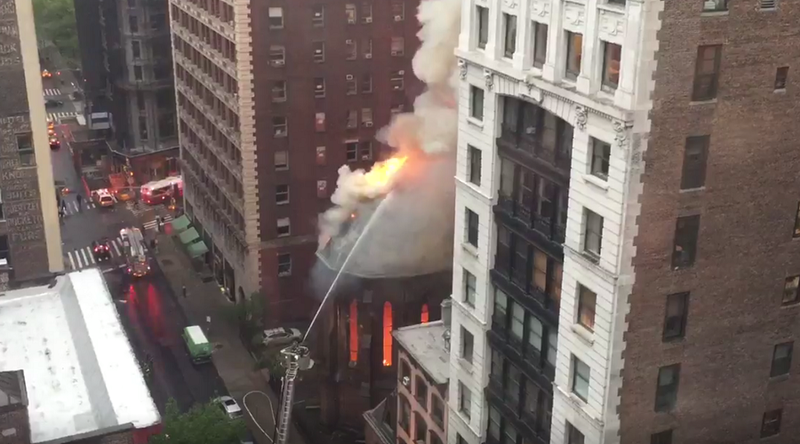 Social Media footage from the scene of the accident on West 25th Street in Manhattan shows an inferno swallowing the Serbian Orthodox Cathedral of St. Sava, a historic church located at 15 West 25th Street between Broadway and the Avenue of the Americas in the NoMad neighborhood of Manhattan, New York City. The Gothic Revival-style cathedral is an 1850 creation of architect Richard M. Upjohn. The parish was part of the Episcopal Church for several decades until 1915. The Serbian Orthodox Church purchased the building, designated a New York City landmark, from the Episcopal Diocese in New York in 1943. Prior to the devastating fire the church, according to its Facebook page, had been holding vibrant and joyful Easter liturgical celebrations. “It’s heartbreaking. My parents were the first couple married there in 1944 after it was reconsecrated as an Orthodox church,” Melana Pejakovich, who now lives in Nevada, told RT. Her father was a soldier in the US Army at the time, and the wartime wedding was put together with the help of friends sharing their rations. As of Monday morning, firefighters were still spraying the building with water. "We don't have access to it at the moment. Investigation is in progress," the church announced on its Facebook page.